ASRock has officially unleashed its latest Haswell-E X99 motherboard featuring a staggering 18 SATA III ports and 2 Ultra M.2 ports – the ASRock X99 Extreme11 motherboard. The ASRock X99 Extreme11 is definitely built for someone who needs a huge storage server with lots of storage options. The Extreme11 also features a 12 phase power design and is capable of 4-Way SLI/CrossFireX at 16/16/16/16 configuration. How is it possible? Check out the rest of its features and specifications from the official release below. One thing that you can’t possibly miss on this monstrous motherboard is storage connectors! 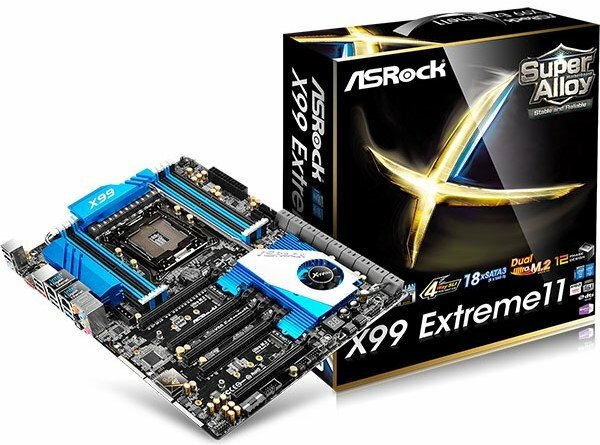 ASRock X99 Extreme11 boasts a total of 18 SATA3 connectors on the side of the motherboard, including 10 SATA3 6.0 Gb/s connectors from Intel® X99 and 8 additional SAS-3 12.0 Gb/s connectors by the added LSI SAS 3008 controller chip. Tests at ASRock’s lab showed that the data transfer rate could reach an unbelievable 6.1 GB/s when SSDs were connected to the storage ports! If you thought that that was the end of the storage options for the world’s most powerful X99 motherboard, then you’re dead wrong. There are also two more of the world’s fastest Ultra M.2 PCIe Gen3 x4 slots that can hit 2.8 GB/s with SSDs located between the PCIe slots too. An insignificant yet crucial reason why ASRock X99 Extreme11 outperforms its nemeses is because ASRock’s X99 motherboards implement a luxurious 12 Power Phase Design while others have downgraded to merely 6 or 8 power phases. This special VRM design allows the motherboard to score better performance with less power and at cooler temperatures, but don’t just take our word for it, listen to the authority on tech – Tom’s Hardware agreed too that ASRock’s 12 Power Phase Design brings better power/performance efficiency. To claim greatness, one must walk the talk. Having sufficient PCIe slots for building 4-way SLI or CrossFireX is fair and square for any high-end platform. However it’s still not enough for the world’s most powerful X99 motherboard. ASRock X99 Extreme11 has five PCIe Gen3 x16 slots plus two embedded PLX PEX 8747 bridge chips for enabling either 4-way SLI or CrossFireX at x16/16/16/16 full throttle! ASRock X99 Extreme11 is the flagship of ASRock’s Super Alloy Series. It can be powered by Intel® Core™ i7 and Xeon® 18 Core Processers (LGA 2011-3). Besides the aforementioned merits, this motherboard is also geared with XXL Aluminum Alloy Heatsinks, 12 Power Phase Design, Nichicon 12K Platinum Caps, Premium 60A Power Chokes, Premium Memory Alloy Chokes, and Ultra Dual-N MOSFETs. This is the most effective VRM solution for generating beastlike performances while maintaining low power consumption and low temperatures. Other features include dual Intel® Gigabit LAN with support for Teaming, the eargasmic Purity Sound 2 plus Nichicon Fine Gold Series Audio capacitor combo. And how could anyone possibly forget the DDR4 memory upgrade on X99 systems? This motherboard comes with 8 memory DIMM slots that may support DDR4 quad channel ECC and UDIMM/RDIMM memory modules up to 3400+(OC). Seriously, there might be 99 ways to be extreme, but nothing gets more extreme than X99 Extreme11! 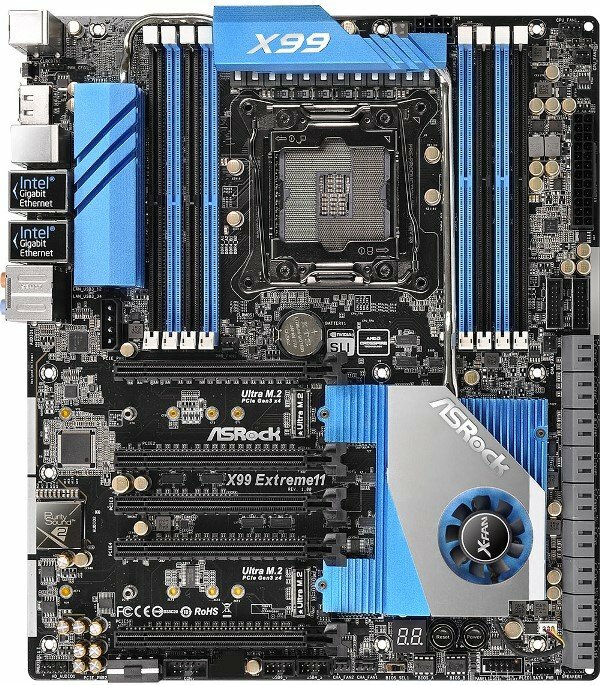 As of today, the company hasn’t disclosed the manufacturer’s suggested retail price for the ASRock X99 Extreme11 motherboard. However the company did mention that this model may not be sold worldwide. I’ll try to update this post later if ever it becomes available to order online. UPDATE: The ASRock X99 Extreme 11 is now available and comes with a retail price of $649.99. You can order one from Newegg here.